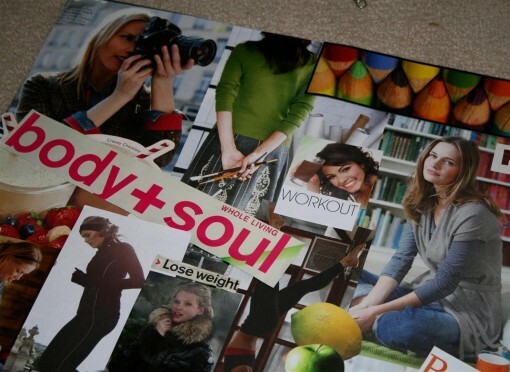 Vision Boards and a New Year was posted on December 31st, 2012 and is filed under Arts & Crafts, Healthy Living. This entry has 7 comments. You can follow any responses through the RSS 2.0 Comment Feed. The last day of 2012. Wow. This has been an amazing year…a lot of change and a lot of growing. Now I’m looking ahead and am so excited about what God is going to do this year – with Him life is always an adventure! Before each New Year, I’ve started a tradition of making a vision board. It’s fun to do and I love looking at a visual that reminds me of my goals every day. The pictures all mean different things to me…for example, the girl taking a picture at the top symbolizes that I want to get better at photography this year. That’s the fun thing about vision boards, you find pictures and words from old magazines or papers that “speak” to you and then get all art crazy. I had so much fun I covered an empty notebook and covered it with mac-tac. This will probably be where I put my written goals. I also write out a long “master list” of everything I want to get done in a year. It’s specific and each goal is something I know I can attain. Setting goals (not resolutions – hate the word!) is really important. Think about all the goals you made and didn’t make last year, and ask yourself why it did and didn’t work. From there, you can come up with a plan to make all your goals a reality! After I have my long list, I put it where I can see it every day. Then, at the first of every month I take a few things from the main list onto a monthly list and put that on my wall. From there, I take an item or two and put it on my daily to-do list when it works for me. It’s rare that I don’t finish a year with most of my goals completed…and yes, I’m a list-o-holic. For more tips on setting goals and keeping motivated, check out last year’s New Year post! Since I’m a blogger, I also compiled a yearly list of my goals for Colourful Palate on a separate list. I got this amazing blog planner from Click It Up a Notch (a fabulous photography blog) and I cannot tell you how much of a blessing it is. I write down all my blog post ideas, web analytics, info for companies I work with, scheduled posts, deadlines…in short, EVERYTHING. The download is barely anything ($12) and I feel like a huge burden rolled off of my shoulders when I got all this info down into one binder. I’m organized, feel in control, and have less on my mind. I carry this with me everywhere now. I highly recommend this! I’m also starting the New Year with a fresh leaf physically…I’m going to do Philosophie’s 5-day cleanse to kick off 2013 right! I’d love to have you join me in the fun – you can do this detox anytime! The next post will be all about that…I love starting the New Year fresh with clean, pure eats! Hope your last year was amazing and that 2012 is ten times more amazing! God bless! What are some of your goals for the New Year? Did you complete most of your goals from last year? 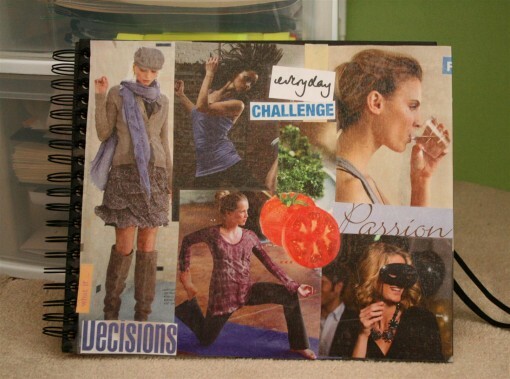 Do you make vision boards? Happy New Years to you and your family!! I see “attend a blogger conference” on your list. MINE TOO! Here’s to hoping we end up at the same one and can meet up! ;-) I am love love loving your vision board/books. You go lady! This is going to be YOUR YEAR! I can feel it. You are so organized. I just kept my resolutions/goals to a minimum. I just strive to be the best me I can be, stress less and play more with my kids. Speaking of my kids, I’m so proud of Hayden for sticking to her goal for 2012. On Jan. 1 of last year, she set a goal of being potty-trained by the time she started preschool in the fall (this past September). We put her in big girl underwear that very day, and she’s been potty-trained for a whole year as of today. On another note, I checked out the Philosophie website again. Looks like she updated it. I love how it looks. I really need to order some of her products. This is the best time of year to get organized. Good luck–sounds like a great burden-lifter for you! Oooh that blog planner is amazing, I can’t wait to get home from work so I can buy one!! And I’m loving your vision boards :) I’m big on goal setting too, and it’s probably about time that I update my vision board! I love your vision board. I’m in the process of doing mine now and am really excited about it. I love your goals! Happy New Year! Vision boards are my absolute favorite. In the past when I’ve made them, I’ve spread every magazine across my floor and spent a whole day just cutting and pasting. So much fun!